We’ve had a short reprieve from the imminent arrival of high 80’s and low 90’s–today’s high was in the mid-70’s, so it was a perfect day for an urban desert hike, especially since I had the day off. I elected to hike a route that I knew would have some traffic, because I was hiking alone and didn’t want to be out in the boonies by myself in case I had an emergency. Never know when you’re going to twist an ankle or a knee. I went to Thunderbird Conservation Area in north Glendale (59th Avenue, north of Deer Valley Road). My first stop was in a little parking area on the east side of 59th where they have built some wildlife viewing blinds that look out over a small lake–however, there wasn’t any wildlife stirring out there this morning, so I got back in my car and drove to the main trailhead parking lot. My intention was to hike back to the east and approach the lake from the north where there are three other viewing blinds, and hopefully get some good shots of birds and wildflowers along the way. 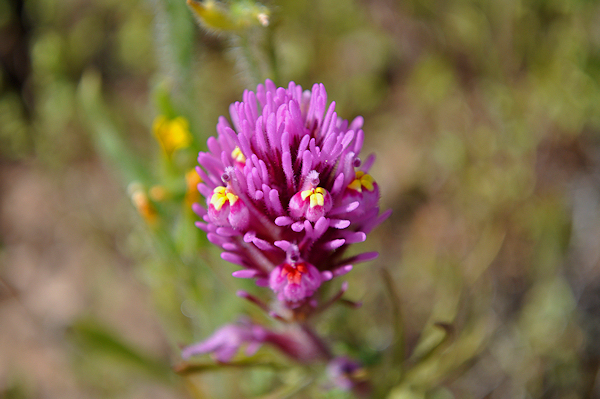 I started hiking up the H1 trail, headed toward the pedestrian overpass, but came across some wildflowers pretty quickly and I stopped to get some closeups with the macro filter. While I as in the process of shooting, a woman approached me to see what I was shooting, and then she changed my plans. She told me that if I took the H3 trail to the west that there was a “huge” saguaro next to the trail where a nesting owl could be seen. Well, that sounded pretty good to me, so I headed west on the H3 trail. I’ve hiked this trail before and knew that it got pretty steep in places, but I knew I was physically capable of hiking the entire thing if I decided to. The shot above was from a little patch of flowers on the side of the trail. No, I don’t know what any of these plants are, but feel free to leave that information in the comments if you know. I just liked the way these little flowers had bits of yellow and red accenting the light purple. 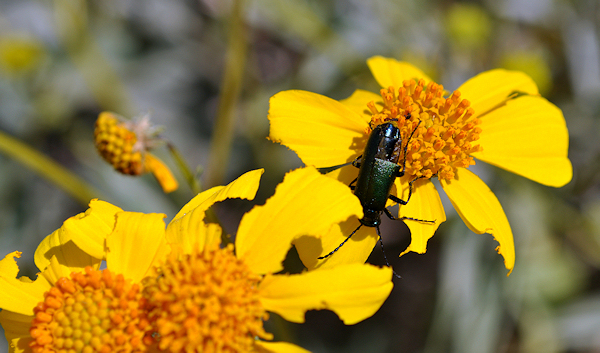 The shot below show what happens when the beetles get hungry! 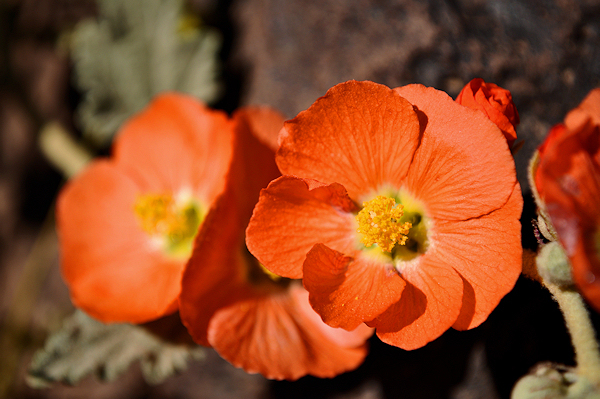 There were tons of these little orange flowers growing along the trailside. It was a little tough to focus on them with the macro because there was breeze that kept them moving, but I tried to use a fairly fast shutter speed to keep them as sharp as possible (although the narrow depth of field was an additional challenge). And finally, the cactus are just starting to bloom. I found a couple of specimens that had these beautiful blooms on them. 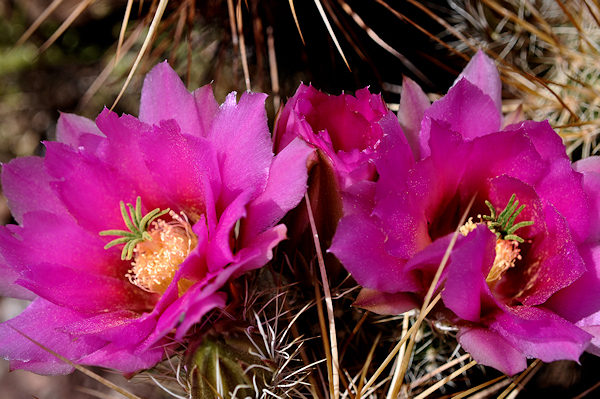 The barrel cactus are also just starting to bloom, but I didn’t find any flowers that were fully open. All of these were shot as high-resolution JPG files. I’m trying to work on the “Zen of letting go” when it comes to my photo files. I got into the (bad) habit of shooting everything in both RAW (NEF) and high-resolution JPG because I was learning to do HDR’s. However, I tend to take a lot of shots, and so my hard-drive space is rapidly being devoured by all these files. I have a hard time deleting any of them–what if I might need them in the future and they’re not there?? Oh, the horror!! Anyway, today I started my workflow by deleting all the NEF raw files, and only saved the JPG files. Then, when I processed the JPG’s in Paintshop Pro, I didn’t save the original copy. I just saved the processed version. And you know what? It really didn’t hurt that bad to let all those files go. Now I just have to make time to go back to my previous folders and clean them out as well. I wound up with 26 macro images that I posted to Flickr. They are available in the set titled “Thunderbird Conservation Park in Spring“. I hope you’ll stop by and check them out, the colors are beautiful. I also have quite a few photos that I took without the macro filter, and I’ll be going through them later and possibly posting some. Hope you all have a blessed weekend–get out there and enjoy life!! This entry was posted in Commentary, Processing, Shooting and tagged Arizona, AZ, cactus, camera, D5000, depth of field, desert, Glendale, hiking, macro, Nikon, Paint Shop Pro, park, photography, software, Thunderbird Conservation Park, wildflowers, Zen. Bookmark the permalink.